The pop analysis of James Comey and his internal dramas in encounters with other public officials –e.g., the president – continues. Most men, in writing or speaking about their recollections of professional encounters, tend to avoid the overtly emotional, or levels of detail that serve mainly to illuminate their own interior dialogues. Not Mr. Comey. Comey doesn’t just record these interior eruptions. He turns them over for inspection, and incorporates them into explanations of his motives and decision-making. My initial grimace-face moment on Comey’s diary-keeping came when his friend Benjamin Wittes explained that Comey wanted to hide himself against the drapes during a ceremony in the White House’s Blue Room. The 6’8’’ Comey, wearing a blue suit, hoped to escape Trump’s notice by blending in with the décor. Since the ceremony was about recognizing law enforcement officers and initiatives, this seemed a bit…silly. Let’s leave the adjectives at that. Comey was in charge of the main federal law enforcement agency, and was there representing all the men and women of the FBI. For their sake, if for nothing else, the standard posture would be one of expectant pride: in the agency and all its fine people. It’s not about Comey, it’s about them. What an honor, to accept kudos from the president on their behalf. Right? But, apparently, no. By Wittes’ account, Comey’s priority was to avoid a direct encounter with Trump altogether. 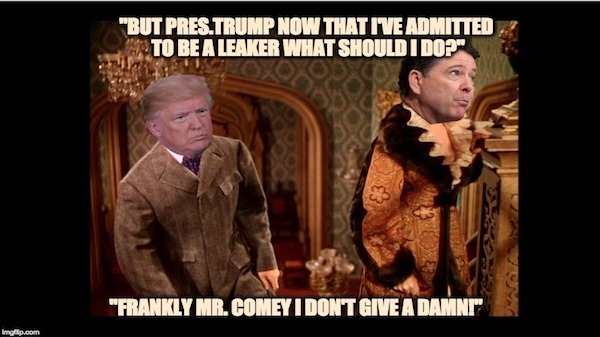 Comey’s stated concern: that Trump would try to hug him. The words “drama queen” begin to obtrude ever so slightly on the edges. Seriously, the director of the FBI can’t just cowboy up, have a handshake with the president, and shrug off an unwanted shoulder-grip if he must, in order to represent his agency and his position of public trust at a ceremony? It hasn’t seemed surprising that the Girlfriend Pundits of America have been weighing in on Comey ever since. Hey, you lob that stuff out there, your gal pals are going to take it up for a good thrashing. Comey talks the way girls talk. A few moments later, the President said, “I need loyalty, I expect loyalty.” I didn’t move, speak, or change my facial expression in any way during the awkward silence that followed. We simply looked at each other in silence. Yeah, you go, girl. That’s the kind of juicy detail Congress needs: that you didn’t move, speak, or change your facial expression in any way. The question does just begin to form: Why, if you thought the “loyalty” reference might be an improper one, did you not respectfully ask what the president meant by his words? But quibbling in such black and white terms is linear, binary, and, let’s face it, patriarchal. Comey’s not about goals or outcomes. His thing is recording his personal reactions to the other guy, and justifying whatever he, James Comey, did. RUBIO: The president’s wishes were known to [the public], certainly by the next day when he had a press conference with the prime minister. Going back, the three requests were, number one, be loyal. Number two, let the Mike Flynn thing go. He is a good guy, been treated unfairly. Number three, can you please tell the American people what these leaders in Congress already know, which you already know and what you told me three times, that I’m not under personally under investigation. That’s it. All the rest is James Comey’s histrionics. Yep. Now imagine Rubio summarizing Gone with the Wind for us, and moving on. RUBIO: Scarlett O’Hara survived the Civil War and its fighting in Georgia. She married three men, two of whom died. She gave birth to three children. She saved her family cotton plantation and made it productive again. Her sister-in-law died, and Scarlett discovered she didn’t really love her sister-in-law’s husband. Scarlett’s third husband, Rhett Butler, walked out on her at the end, but Scarlett was determined to win him back. All the rest is back story and histrionics. But here’s the really interesting question. And it’s not whether the story is worth telling without the histrionics. No, the GWTW analogy raises a better one. The interesting question is why a story that only sounds meaningful and compelling with the histrionics should figure as something probative in testimony to the United States Senate.